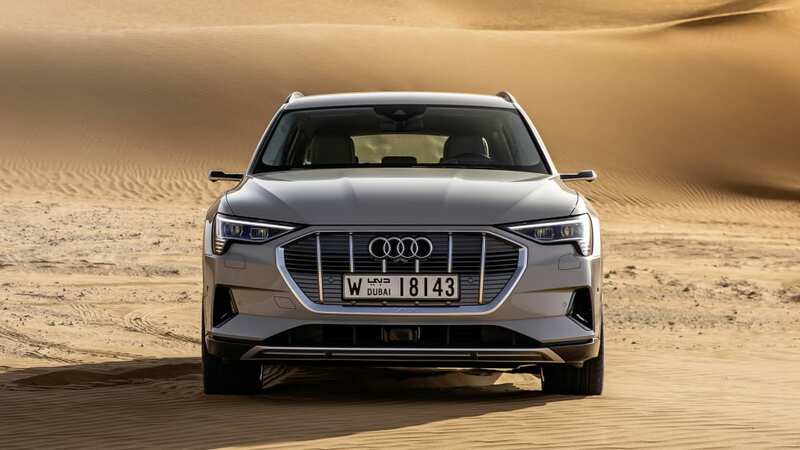 The 2020 Audi E-Tron is an Audi with a battery. Depending on how much you investigate that statement, that makes the battery-electric luxury mid-sized SUV three things: boring, fascinating, and an important milestone. 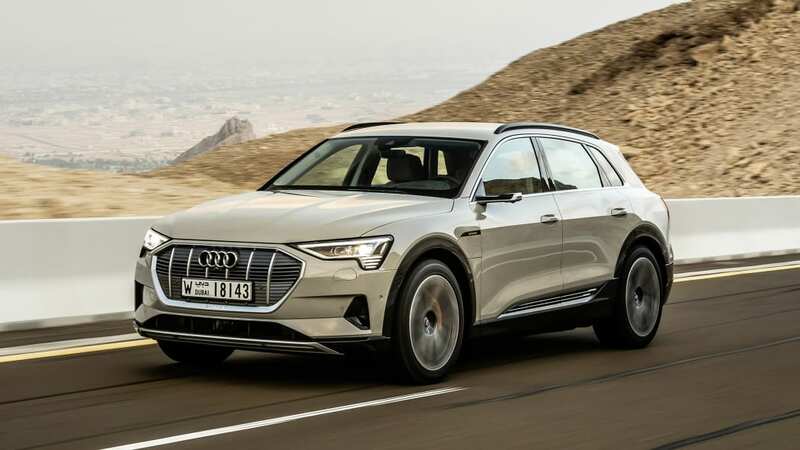 Boring because the E-Tron looks and drives just like an Audi SUV. 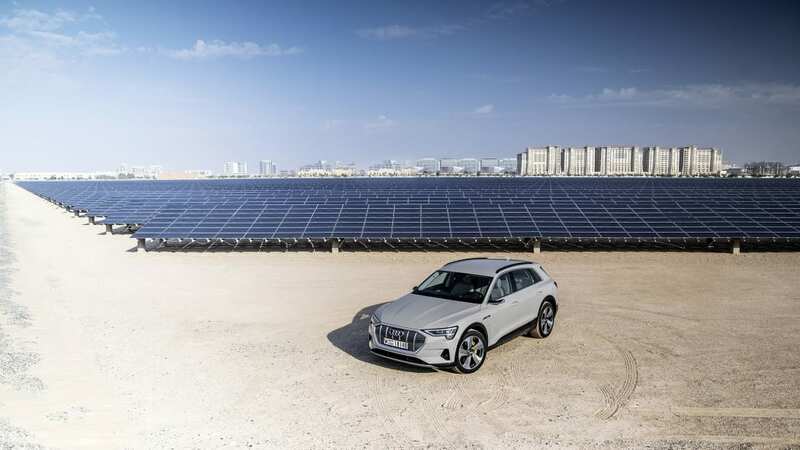 Fascinating because underneath those familiar tingles, Audi poured enormous resources into a dedicated platform that addresses the near- and long-term challenges and possibilities inherent in an EV. 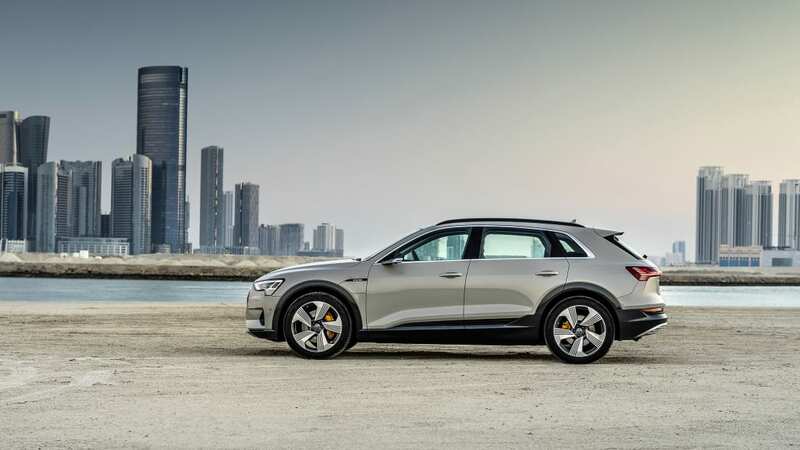 An important milestone because the E-Tron will be one of the first OEM luxury crossover to challenge the Goliath of the segment (you know who we're talking about), joining the Jaguar I-Pace. The E-Tron screams Ingolstadt. Lead exterior designer Stephan Fahr-Becker said, "In the clinics the customers asked us, 'Can we just have a nice-looking electric vehicle? 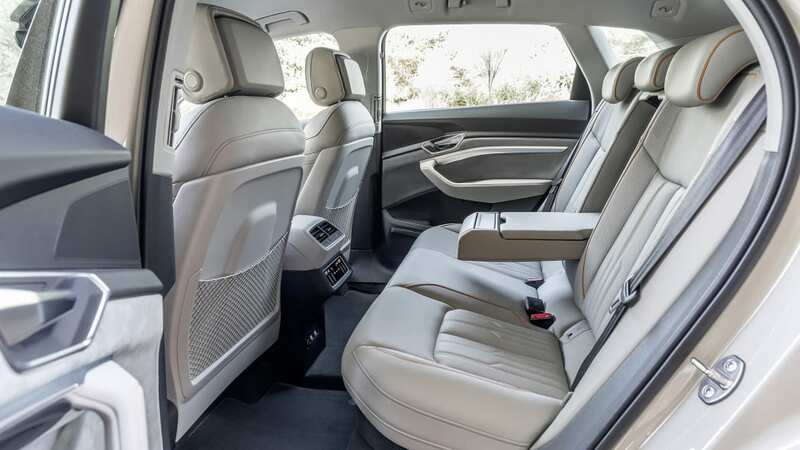 '," so Fahr-Becker gave them what is effectively a Q6 with easy seating for five. 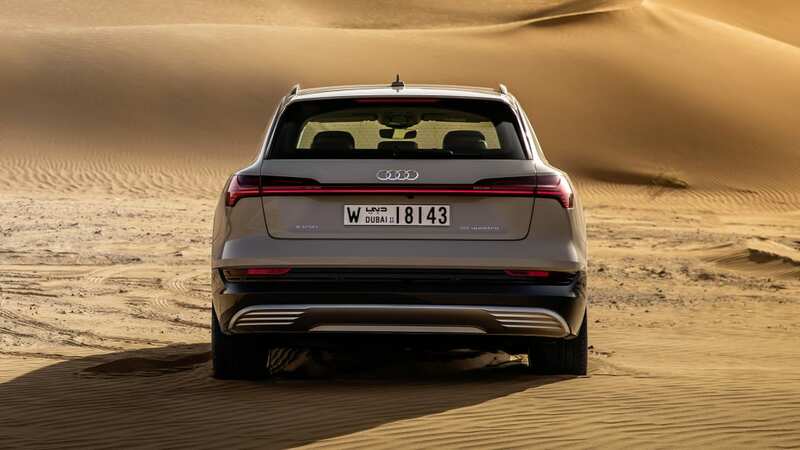 The 115.1-inch wheelbase is 4.1 inches longer than Q5's and 2.8 inches shorter than the Q7's. At 193 inches long, 65.5 inches high, and 76.3 inches wide, the dimensions shrink the Q8 by a touch. The Tesla Model X is five inches longer and a little wider. Vacationing families get 28.5 cubic feet of cargo spaces behind the rear seats, 57 cubic feet with the seats down. Singleframe grille? Check. Matrix LED headlights, neutered in the U.S.? Check. Roughly trapezoidal profile with heavily rounded corners? Check. 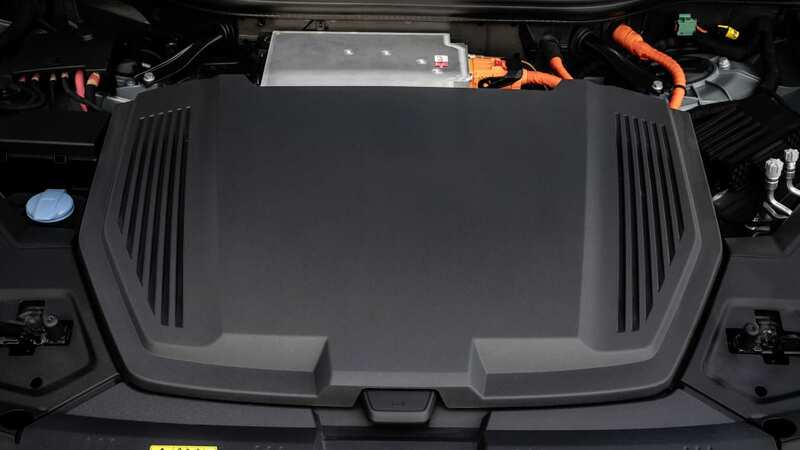 To flag EV status, there are flourishes like hashmarks in the corners of the headlights to mimic a battery charge bar, and slats in the rear that replace tailpipes. And while European models like the one we drove wear Manhattan Grey along the hem for a two-tone look, U.S. models come in solid colors. A proven cabin aesthetic preferred by European villains and CFOs who wear $1,000 prescription glasses showcases familiar, Mondrian-esque exactitude of line separating lacquer, leather, and satin. Here is the Virtual Cockpit, there the twin-screen center console for MMI and climate controls, all seen before in the A6, A7, and A8. The gear selector differs, being a chunky toggle at the end of a handrest that channels Audi's traditional gear selector. A Power Meter that reads in percentage replaces the tachometer in the Virtual Cockpit, but even the Predictive Efficiency Assist is a re-written update of the graphic efficiency aid from other Audi vehicles. Audi slathered gobs of sound-deadening throughout the body, including behind the door panels, to obviate need for artificial noises in the cabin. Under acceleration at highway speed one hears a hint of the faintest of whines from the two electric motors. The loudest noise comes from air tumbling over the outside mirrors, a gentle rushing subtle enough to be washed away by conversation, never mind the standard, 16-speaker, 705-watt Bang & Olufsen stereo. As for using the virtual mirrors, if they're the future, the future will take more than a day of driving to get used to. In typical driving the electric motors provide 360 horsepower and 414 pound feet of torque, the larger 165-kW rear motor doing nearly all the work, the 135-kW front motor grabbing an oar in milliseconds when necessary. 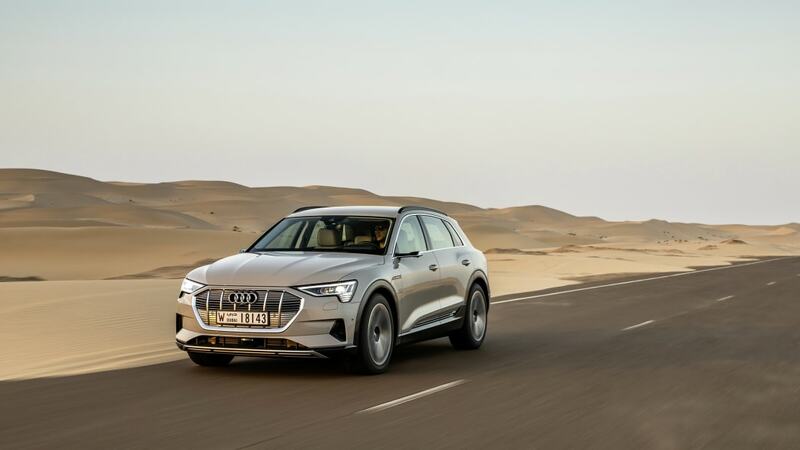 These are fine numbers, that instant torque goosing the E-Tron's 5,500 pounds without drama. In Sport, pushing the accelerator pedal past a detent activates Boost mode. 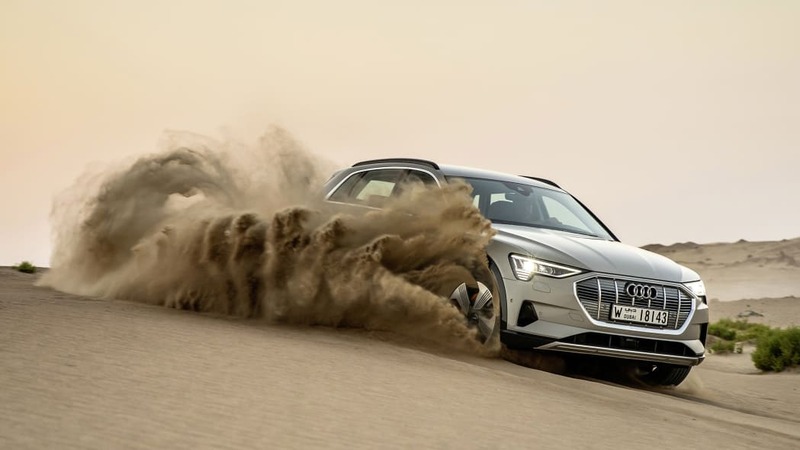 Each motor goes into overdrive for up to eight seconds, with output increasing to 402 hp and 490 lb-ft. Audi's quoted 5.5-second dash to 60 miles per hour is on Boost, so figure about 6.4 seconds to reach 60 without. Boost can be accessed repeatedly by letting off the pedal for a few seconds, then mashing again, but you're unlikely do so outside of a closed course. Acceleration comes on so quickly that even from a standstill, by the time eight seconds passes you'll be beyond any legal U.S. speed and closing on the 124-mph top-speed limiter. 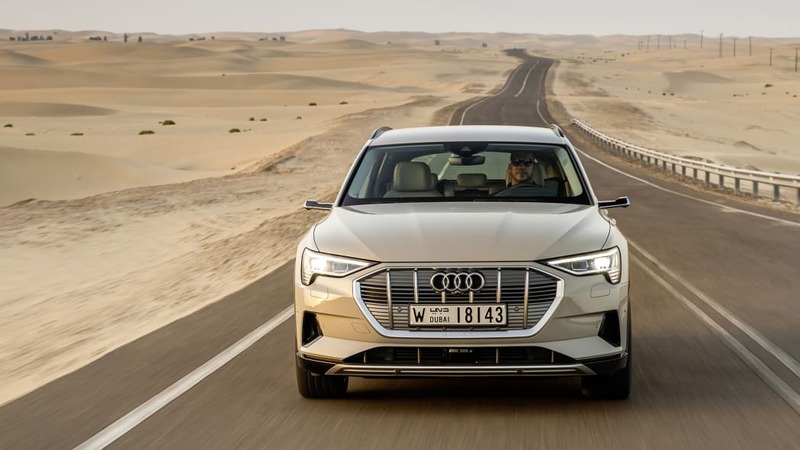 Doing the most up the snaking, incredible Jebel Hafeet Mountain Road near Abu Dhabi, where we traveled to drive the E-Tron, proves this EV can provide lumber-free turn-in on command, aided by brake-based torque vectoring. 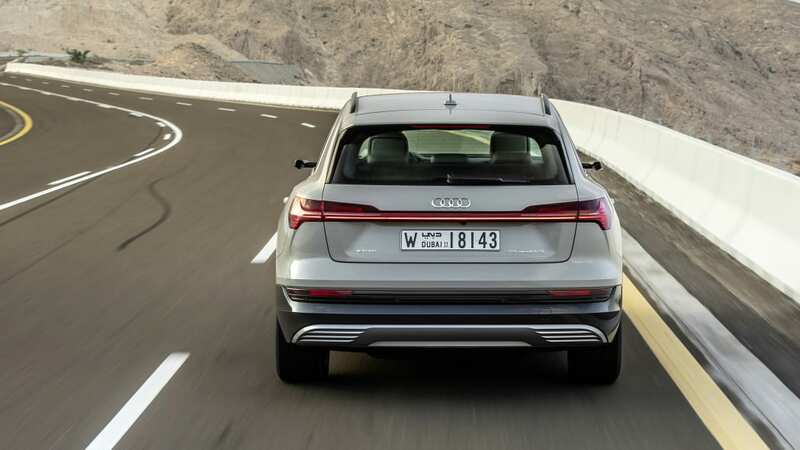 The Q7 contributed its adaptive air suspension, retuned to manage the E-Tron's additional 500 pounds. You have to go all Light Brigade to compel squeals from the 255/50R/20 Goodyear Eagle Sport All-Seasons. After accidentally going way too fast into the last sharp corner, we stomped on the left pedal. 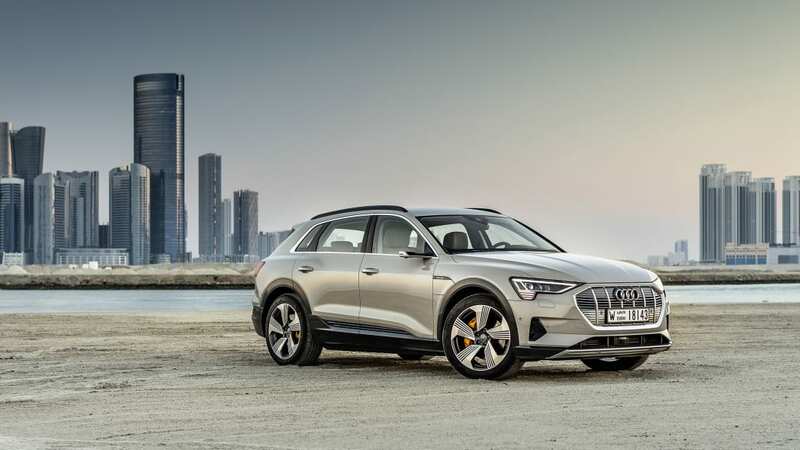 The E-Tron wears pair of 14.8-inch discs with six-piston calipers in front, single calipers in back clamping 13.8-inch discs, for just such an event. The nose dove, speed disappeared, we made the turn with plenty of lane to spare. The E-Tron rides and handles like an Audi crossover, and why not? Audi knows how to make an Audi. 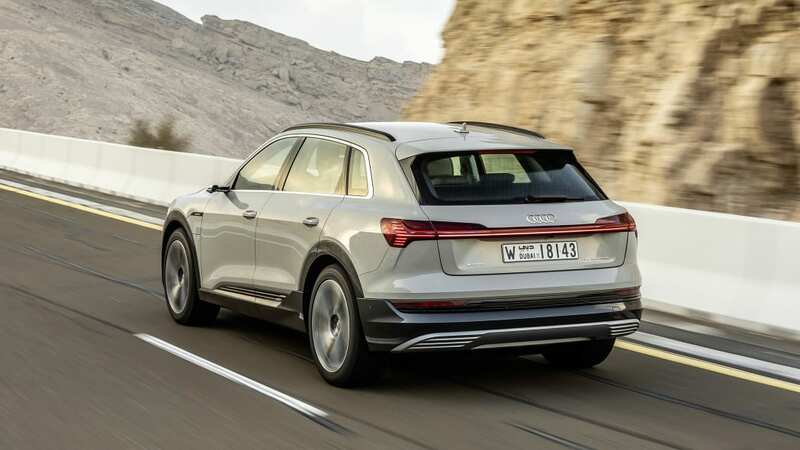 A skosh too much boost renders the steering light, but the typical mid-sized Audi SUV buyer wouldn't have it any other way. Fascinating discoveries live behind the Just Another Audi façade. The most important fact might be this: the E-Tron isn't an electric version of an ICE car. 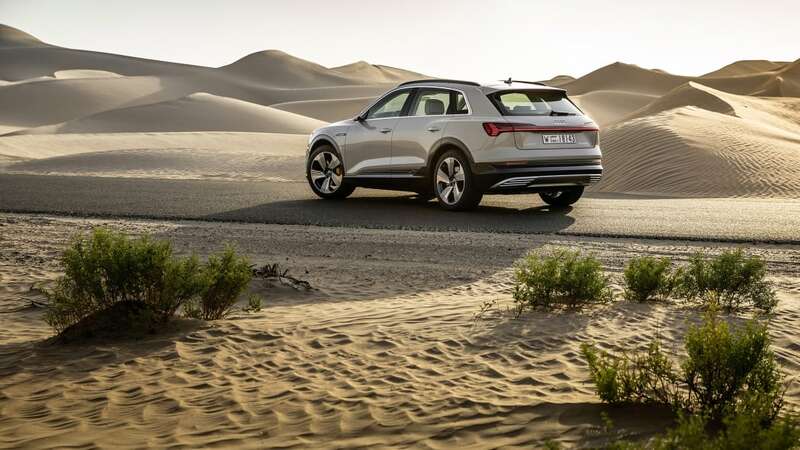 Audi chose to pour truckloads of money and time into solving the near- and long-term challenges of an electric vehicle intended for an audience that expects OEM standards. 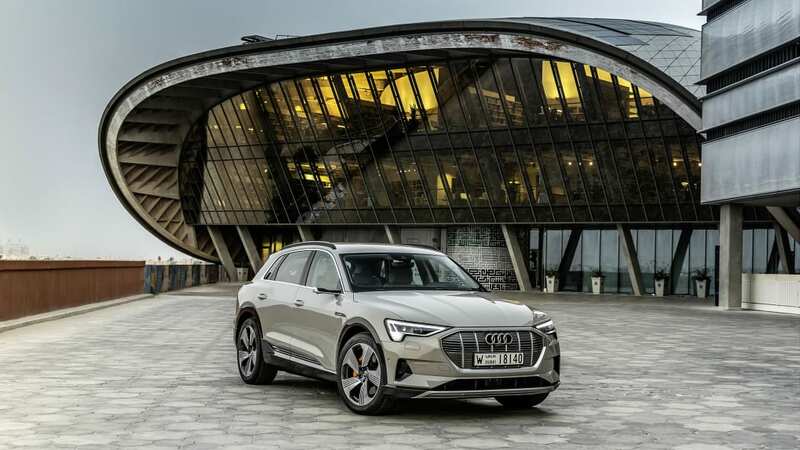 So Audi considers the E-Tron a new platform, even though the crossover's based on the MLB Evo architecture supporting the A4, A6, A7, A8, Q5, and Q7. 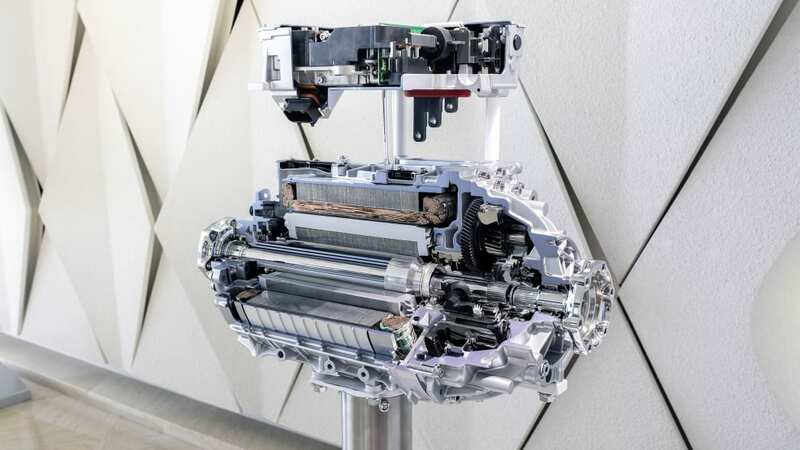 The E-Tron uses different subframes, and they bolt to a new center section that's almost all battery. 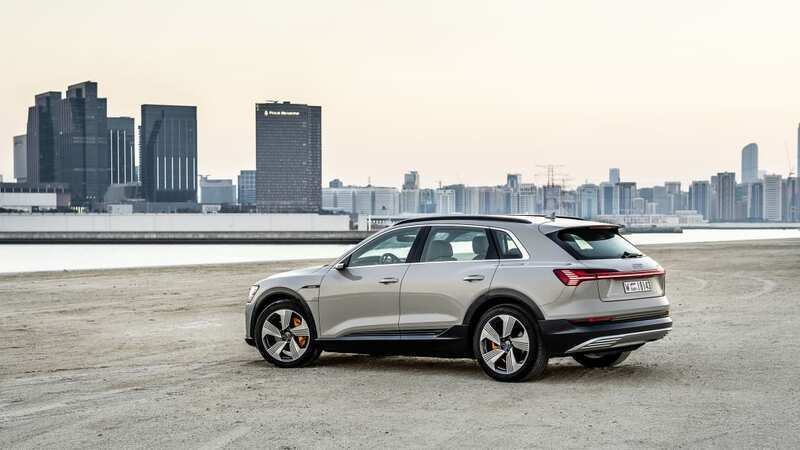 This is a one-and-done platform to serve the E-Tron and derivatives like the E-Tron Sportback. 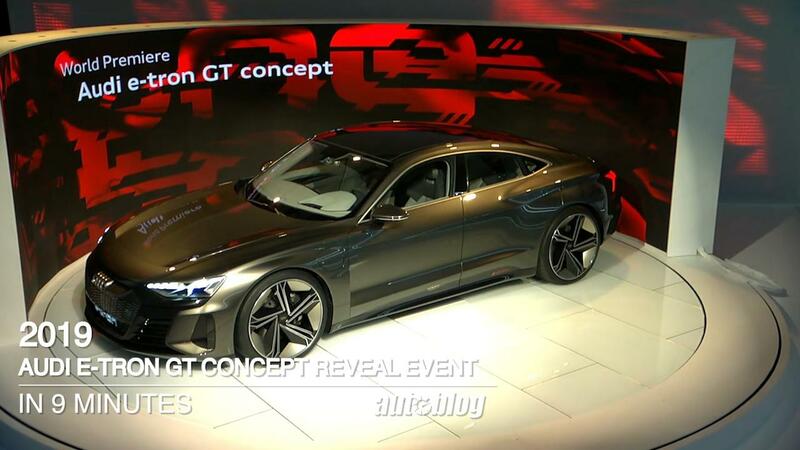 The E-Tron GT will ride on the J1, a different platform shared between it and its Porsche Taycan sibling. After that comes the long-term future, the Premium Platform Electronic (PPE) co-developed with Porsche. Audi USA quotes the coefficient of drag at 0.30, since our version comes standard on 20-inch wheels. You can get that drag figure down by three-thousandths by choosing the 19-inch aero-optimized wheels on low-rolling-resistance tires. An Audi engineer told us that reducing drag by a thousandth of a point extends range by almost a mile. Europeans can add three miles with the virtual side mirrors. In the U.S., redesigned conventional mirrors add 1.5 miles. The vents in the front bumpers contribute another 1.5 miles. In total, engineers found 21.7 miles of range through aero optimization. 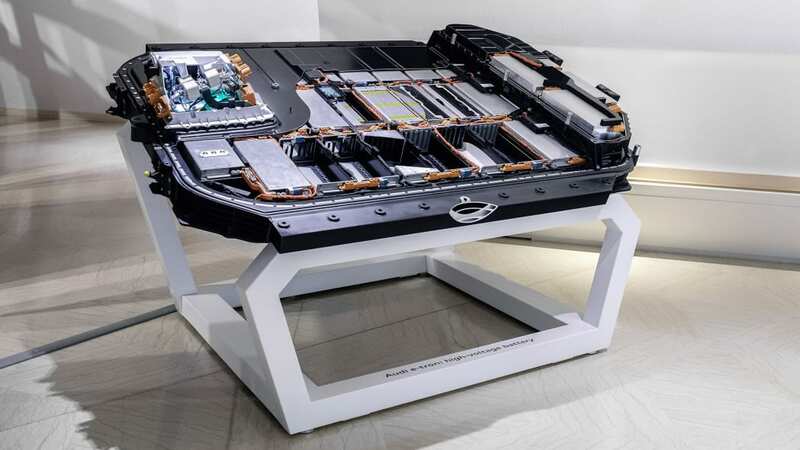 The 95-kWh LG Chem lithium-ion battery is composed of 36 metal shoeboxes, each box housing 12 cells of 3.5 volts each, each cell in a flexible aluminum polymer envelope about the size of a coffee pouch. If a pouch goes bad, an Audi dealer can unscrew the 35 bolts that secure the battery to the chassis and replace one of the capsules. 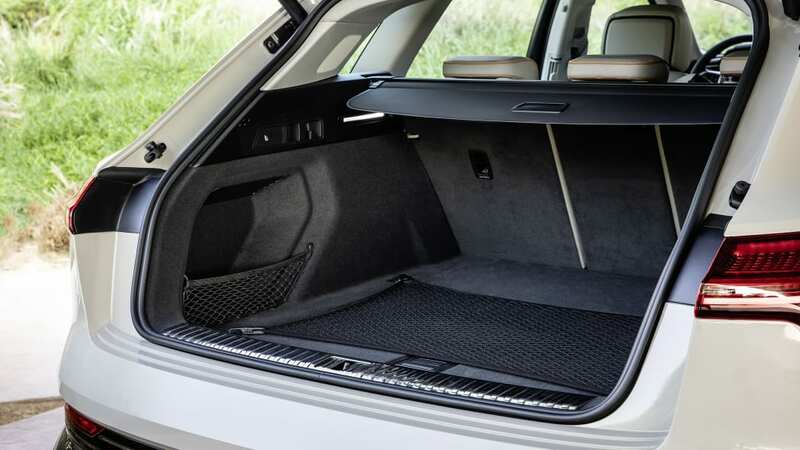 The 432 total cells are arranged in mainly one layer, with a second small tier under the rear seats. An aluminum lattice frame surrounds the shoeboxes, and that structure sits on a honeycomb-filled aluminum base that provides collision protection. 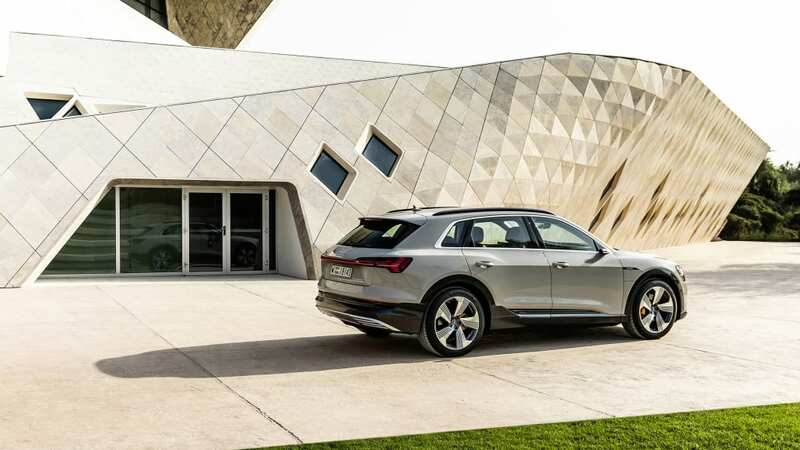 A little more than five feet wide, one foot deep, and 7.5 feet long, the structure's 1,576 pounds contribute to greatly enhanced torsional rigidity and the E-Tron's 49/51 weight distribution. A thermally conductive gel spread among the pouches absorbs battery heat. 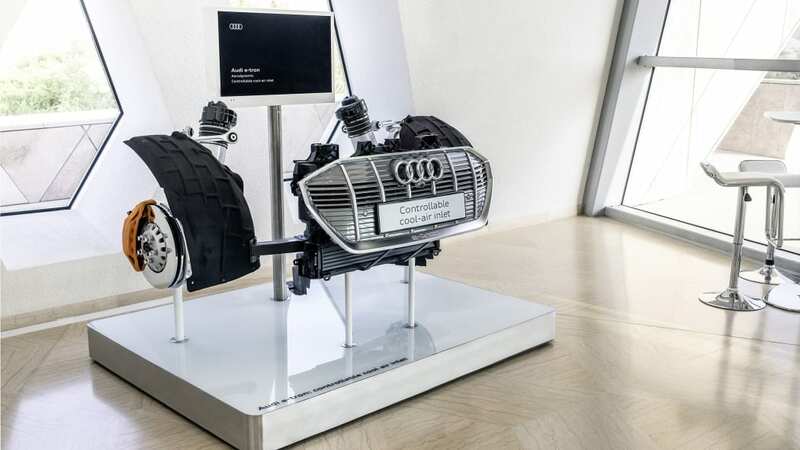 The cooling system, which Audi calls the "chiller," runs antifreeze though laminated tracks on the outside bottom of the aluminum baseplate, drawing heat out of the conductive gel in the battery through the plate. No cooling fluid enters the battery area. In a crash, assuming the vehicle stays upright, the antifreeze falls away from the battery instead of into the battery. That chiller is one of four climate control systems monitoring the mechanicals and the passengers, with 295 switches deciding where to apply cold or warmth. 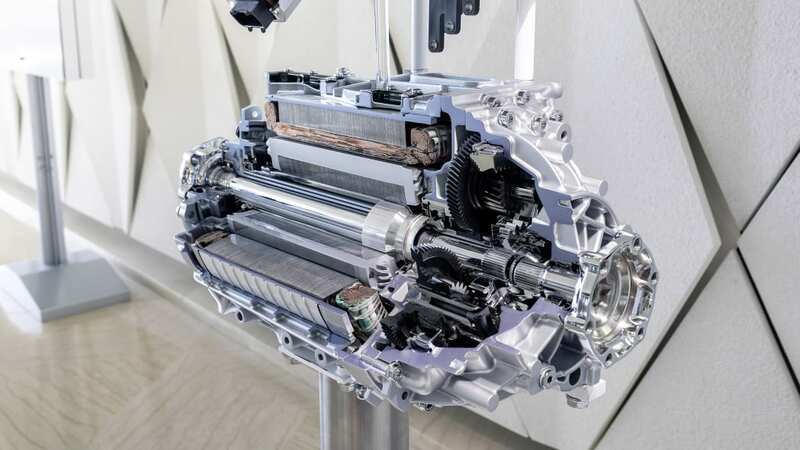 By keeping the battery temperature between about 77 and 95 degrees Fahrenheit, the E-Tron maintains repeatability of performance. 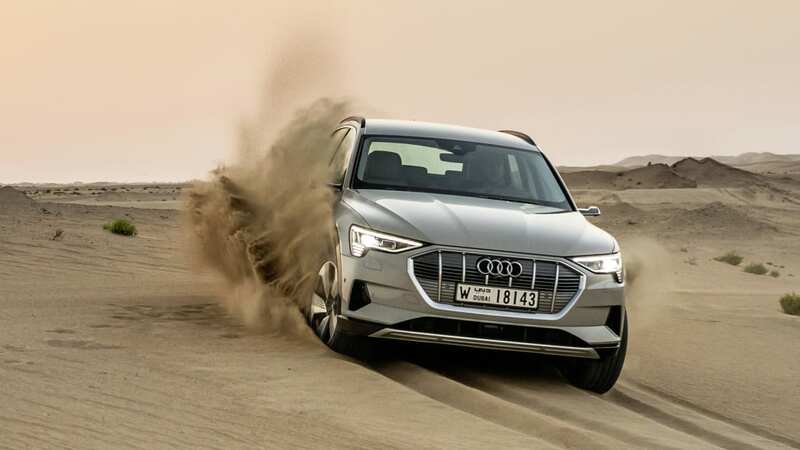 Audi said if you want to do time 60-mph runs, "You can do that ten times in a row, you're always going to get 5.5 seconds," because the battery stays in its optimal operating range. 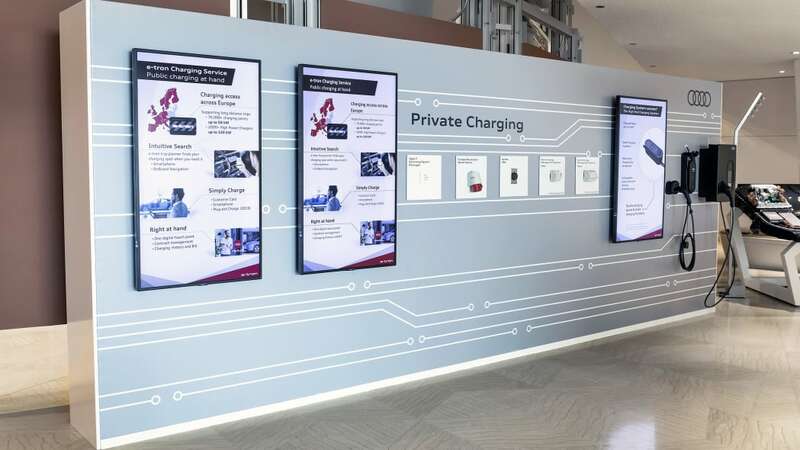 Until the Taycan and its reported 350-kW charging arrive late next year, the E-Tron will offer the fastest charging on the market. Tesla Superchargers top out at 120 kW. That makes the chiller's biggest benefit managing the heat produced by the 150-kW DC fast-charging capability. 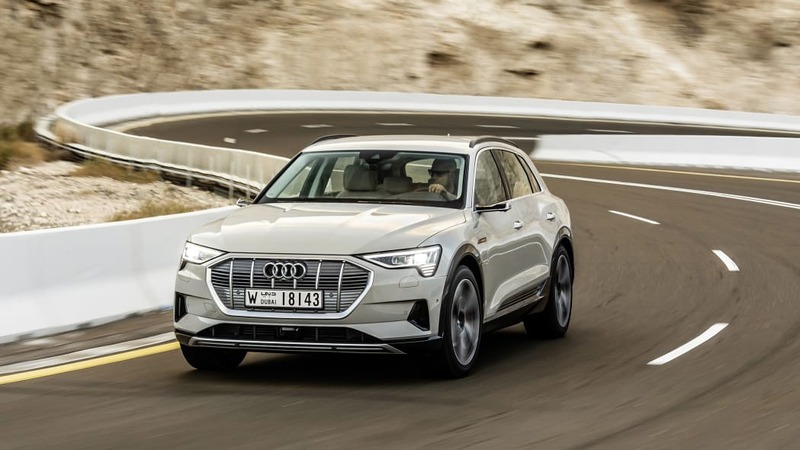 When we asked about battery wear from repeated Boost use and charging stress, Audi told us, "We've done a lot of tests on the aging of this battery, and you're years, years, years out before you have any appreciable loss under normal circumstances. ... The car itself will probably be worn out and gone to recycler before the battery needs to be replaced." The brake-by-wire system tears down conventional EV walls. The brake pedal connects to a mechanical brake simulator, nothing more than a piston pushing fluid into a reservoir. A controller reads brake pedal travel, speed, and force, then sends a signal to the motors, which handle any braking event of 0.3 G or less. Audi expects that to cover 90 percent of braking events. It's easy to read the previous paragraph and not appreciate the leap. EV drivers have been trained to avoid the brake pedal and those wasteful friction brakes, using coasting regen or regen paddles instead, in order to get the most energy back into the battery. 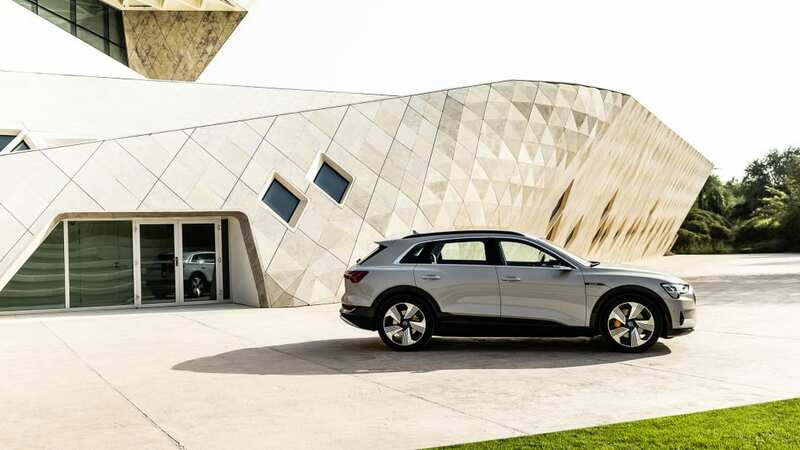 In the E-Tron, 90 percent of the time, using the brake pedal is regen and only regen. The friction brakes aren't used. The calipers activate in severe and emergency situations; at the end of pedal travel, a mechanical valve connects the pedal to the hydraulic system. Because they're so rarely used, the pistons activate once per day to clean the rotors and prevent surface rust. 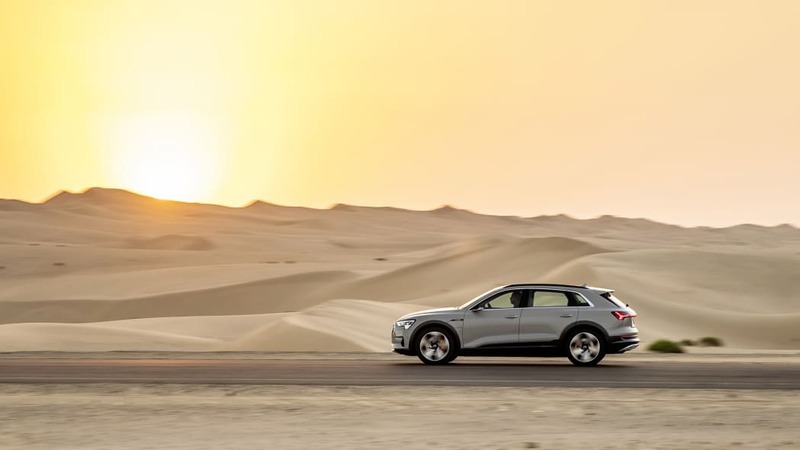 The electronic brakes aren't grabby; in 200 miles of driving, we only had to say, "Oops, sorry," once, and that was when tootling among sand dunes. We called on the friction brakes a few times in a couple hundred miles of driving, through testing or playing Last of the Late Brakers. They join the party seamlessly. Paddles behind the steering wheel cycle through three regen levels – freewheeling, minimal, and high – if you want control. 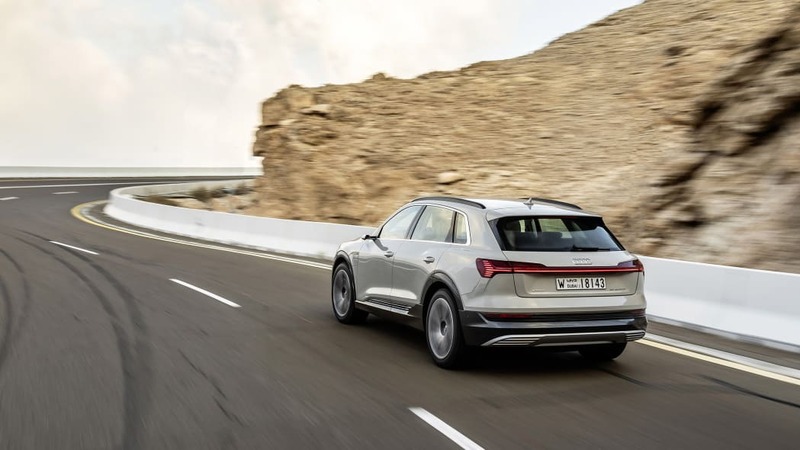 Audi, however, says that driving with the brake pedal is most efficient because a human doesn't have reflexes to outdo a system designed to account for 30 percent of the E-Tron's range. How did this work out on the roads of Abu Dhabi? Well enough for a fine day of driving even though almost all of it was highways, including a stretch with a 100-mph speed limit. We started with 214 miles of range, and punting it around and to the top of Jebel Hafeet Mountain, we ended up driving 112 miles in total, and used 153 miles of range. On the way back, which was heavy on highway with a splash of sand driving, we used up 195 miles to go 124 miles. That kind of energy drain could give someone pause. But one, the E-Tron isn't made for cannonballing, and the day's driving wasn't representative of the planned-for use case. In both cases, the E-Tron had at least 60 stated miles of range left, plenty enough to get thee to a charging station. Nevertheless, we need to get an EPA rating, which will probably come in somewhere between 200 and 220 miles, and spend a day on a mixed American cycle to know how well the E-Tron manages its power, or not. 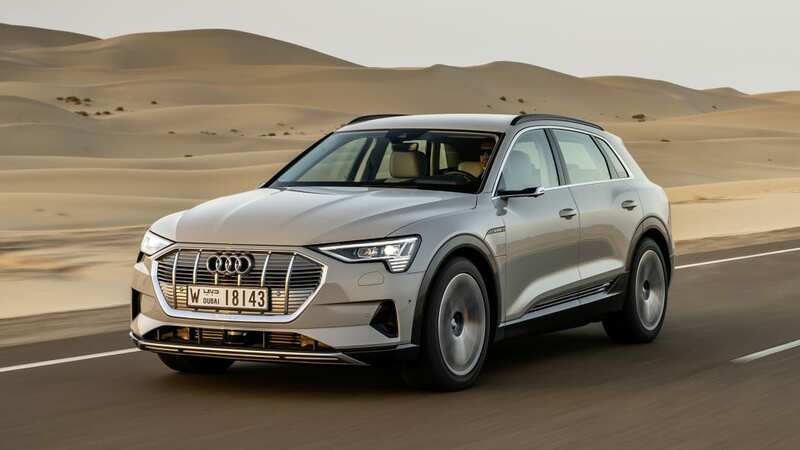 Audi wouldn't say how much of the 95-kWh capacity the E-Tron uses, but we heard there's a single-digit buffer on the top and bottom ends. 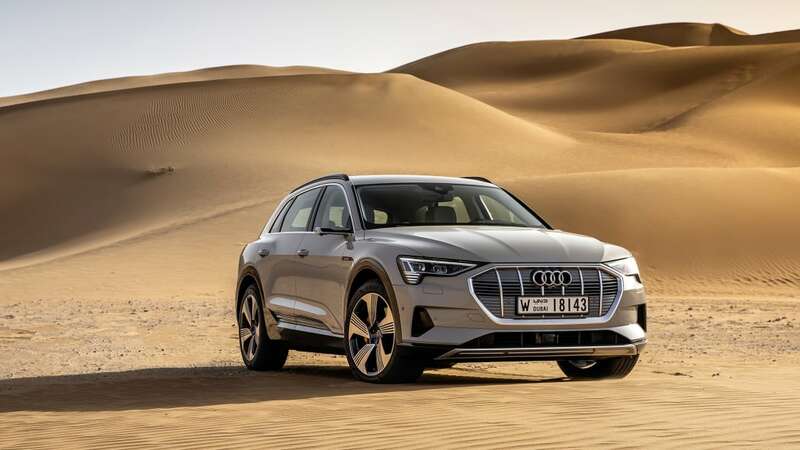 What's certain is that Audi's gone ultra-conservative with battery performance, focusing instead on longevity and repeatability, so there's plenty here to satisfy a risk-averse Audi buyer ready to take a chance on an electric car. 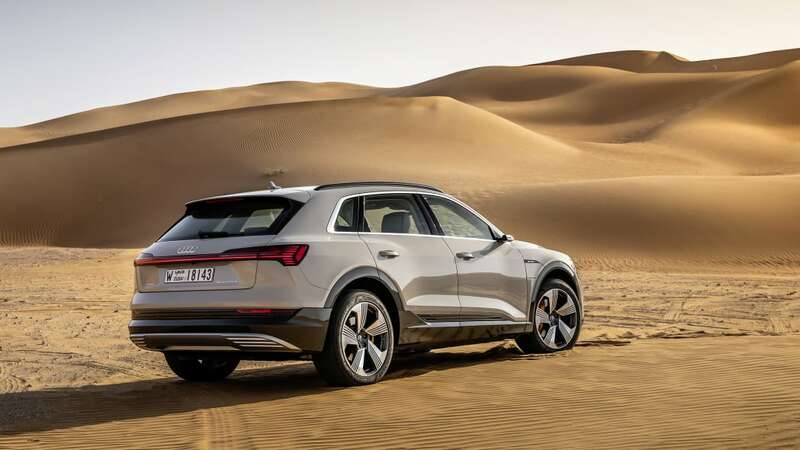 And substantial restraint is how Audi justifies the eight-year, 100,000-mile battery warranty, twice the protection given the rest of the vehicle. 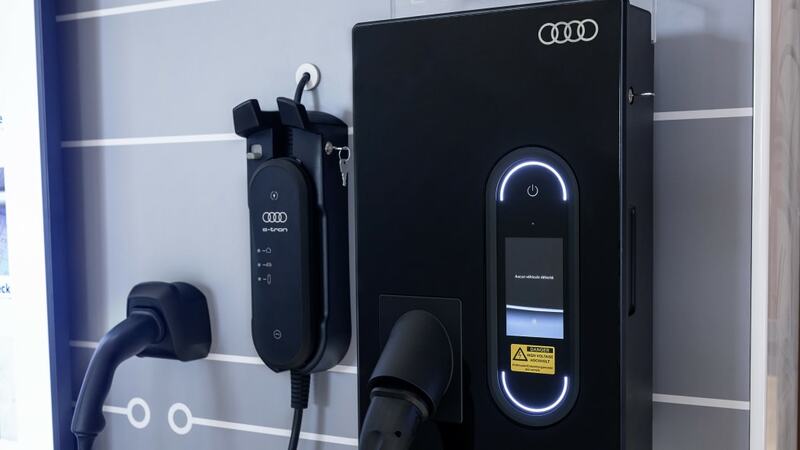 When we asked why Audi designed a battery system that could last longer than the technology, and might last longer than the second owner's tenure, Audi said it has to take the long view. 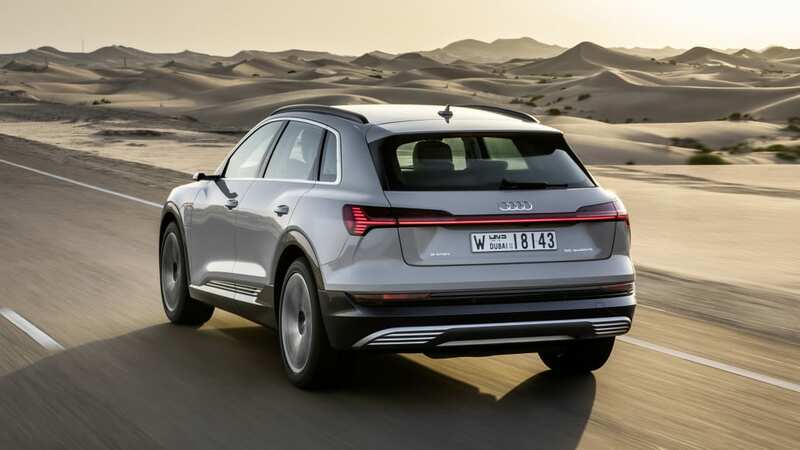 The warranty maintains lease residuals at the end of term, and since Audi's lease penetration isn't as high as with the other luxury Germans, first, second, and potentially third owners need not fear, either. 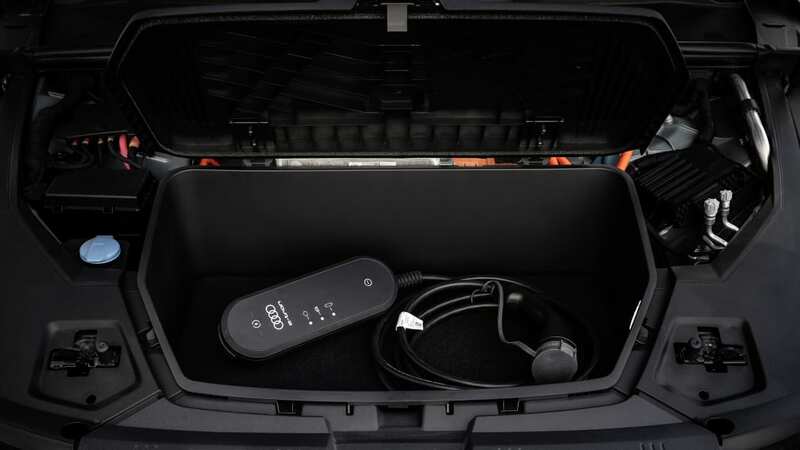 Audi includes a charging cable in a cubby under the hood. Plugged into a Level 2 240-volt outlet, the E-Tron needs from nine to 12 hours to charge fully. A Level 3 DC fast 150-kW charger restores 80 percent of range in 30 minutes, a full charge takes about 45 minutes. E-Trons don't start deliveries until the second quarter of next year. Not long after that, by July 2019, Electrify America plans to have 500 fast charging stations in 40 states and 17 cities. E-Tron owners will get 1,000 kWh of Electrify America charging free, roughly 2,000 miles of driving, that can be used within four years of purchase. The dual-charging port on the left fender accepts Level 2 AC and Level 3 DC chargers. An optional second port on the right fender is AC-only, but the U.S. doesn't get that option in the first model year. 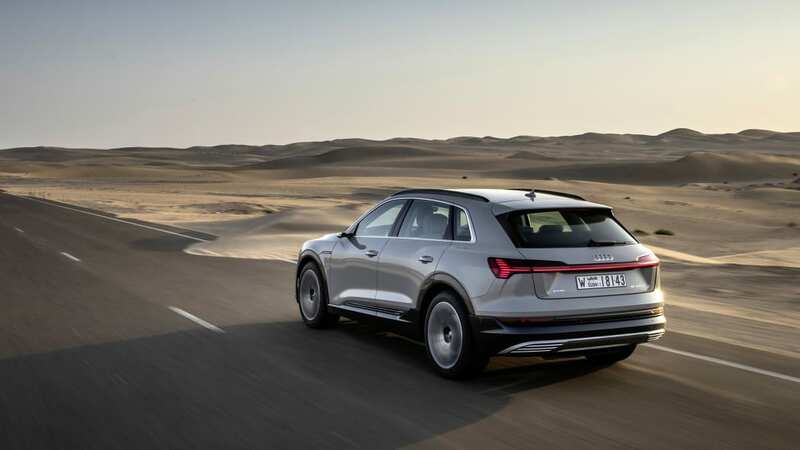 Audi said the second port could make an appearance during the second model year. 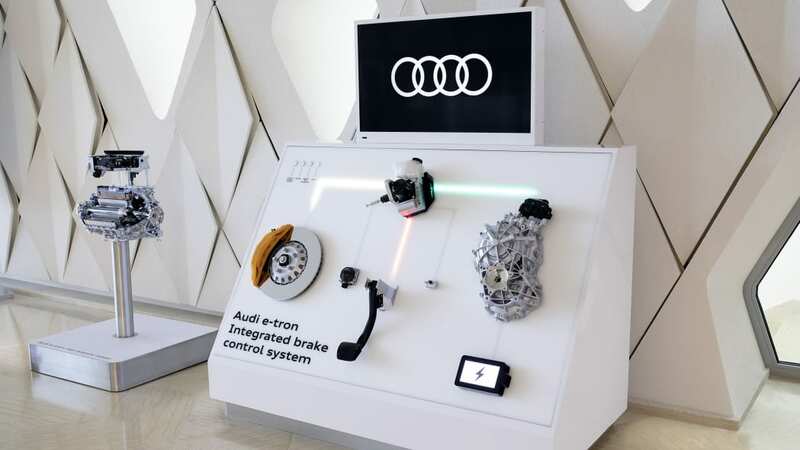 When we asked about wireless charging, Audi's said, "It's not something we're going to bring right away on this car." The carmaker is waiting for the SAE to develop a standard, preferring not to spend on a proprietary system. Price starts at $75,795 for the Premium trim. That makes it the most expensive in the range, $7,400 more than the Q8 Premium, but it includes luxury basics that are optional in the other SUVs – the Matrix headlights, the B&O stereo, the driver assistance tech. The Prestige trim starts at $83,790 before destination, adding features like the Driver Assistance Package with adaptive cruise, dual-pane windows, head-up display, and power door closers. We've waited years for a dedicated luxury offering from a German OEM, and assuming it arrives on time, it will be the first. And the word "dedicated" matters. 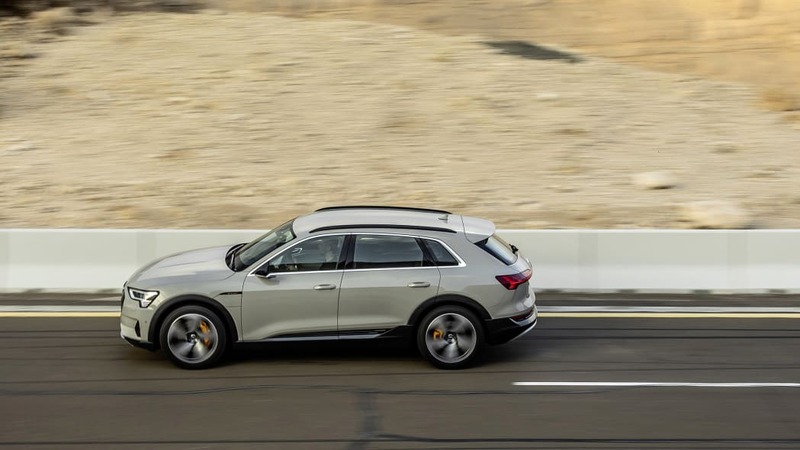 It looks like two other German makers will first introduce electric versions of conventional ICE crossovers, which means they'll include useless artifacts like legroom-robbing transmission tunnels, which the E-Tron lacks. If we're talking about a genuine effort to challenge Tesla, this is where we need to look. 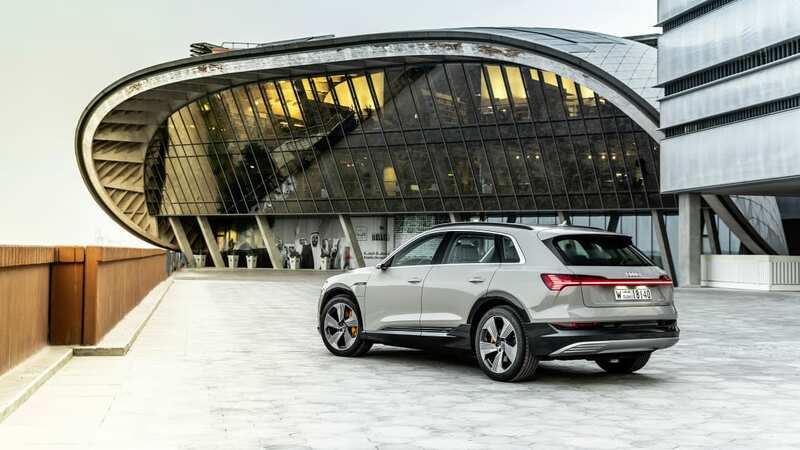 And yet, in many ways the E-Tron isn't a competitor to Tesla; It aims to be the alternative for buyers who want an EV without hubbub and with legacy OEM backing – the same kind of buyer who might be interested in the less-understated, slightly smaller and cheaper I-Pace, which starts at $70,495 and features a 90 kWh battery. 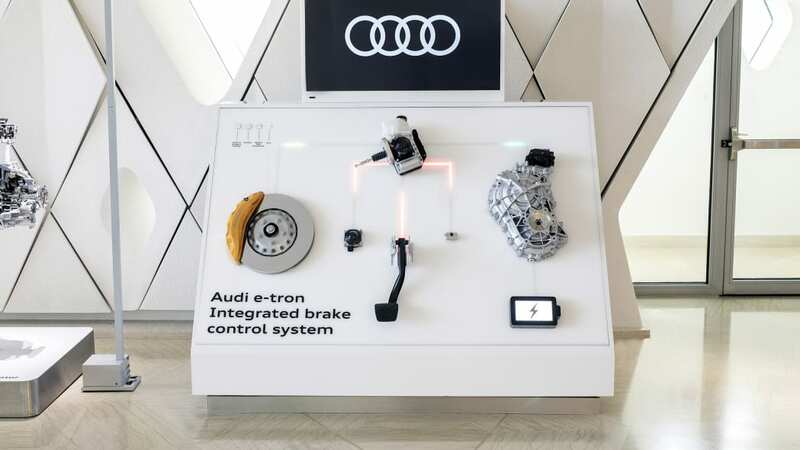 The E-Tron's the draw for shoppers who won't risk inconvenience for bragging rights, who want to exhibit a certain kind of success without standing out. Based on the sales numbers for mid-sized luxury SUVs, that potential buyer pool runs deep. 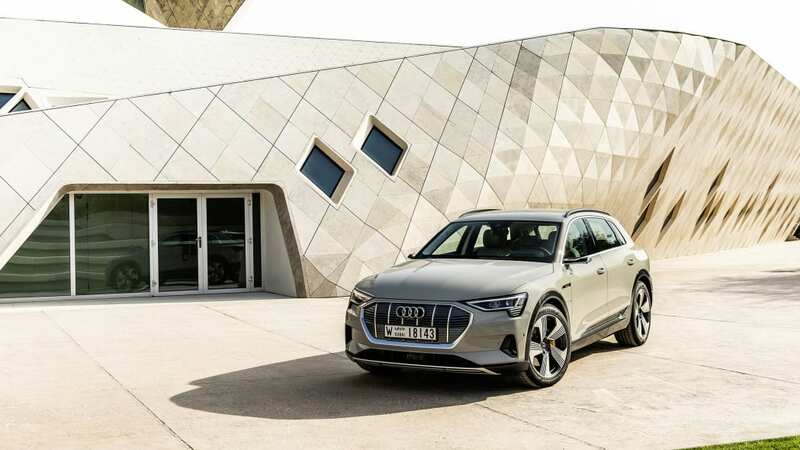 Forget the R8, the E-Tron might be the best exemplar of Audi's tagline: Here is progress through technology, understated but with impressive tech underneath. 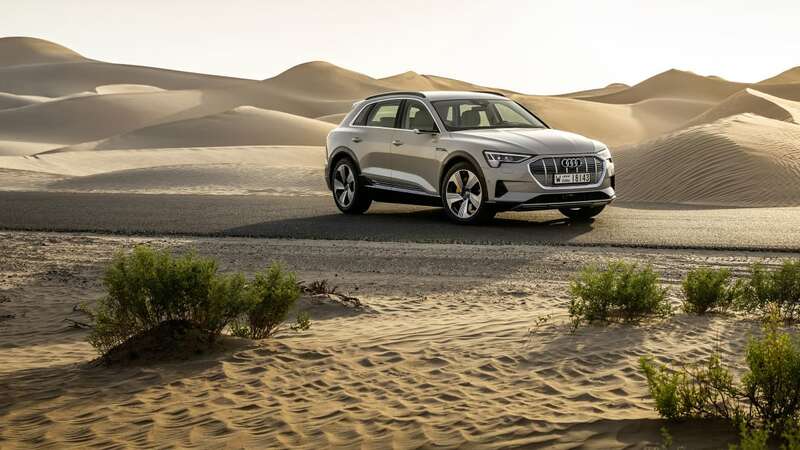 Back when he was president of Audi of America, Scott Keogh said of the E-Tron, "We view the [E-Tron] as a trust leap.... We've tried to make that leap as small as possible." In fact, the new battery-electric crossover isn't a leap at all. It's an Audi.